Amy’s Bike Skills sprung into… Spring! VICTORIA – A metre matters education is all go! The Victorian Transport Accident Commission (TAC) launched the long awaited cycling safety education campaign last month: Drivers, give the space to ride safe. The Amy Gillett Foundation was consulted throughout the development of the education campaign, and will continue to be involved throughout the year-long campaign as further phases are rolled out in 2018. 2017 has been a horror year for Victorian cyclists, with nine cyclists losing their lives on Victorian roads so far this year and countless more being seriously injured. We are committed to working with the authorities to do whatever we can to address this horrifying statistic and make this education campaign a success. 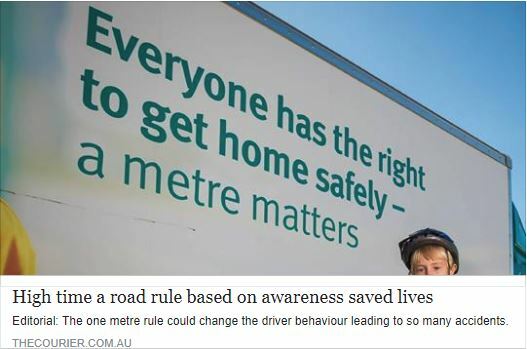 However, we remain equally committed to continuing to push for a metre matters to become enforceable law in Victoria, just like it is in all other Australia states – we have always said that legislation, enforcement and education are required for behaviour change, and that an education campaign alone is not enough. 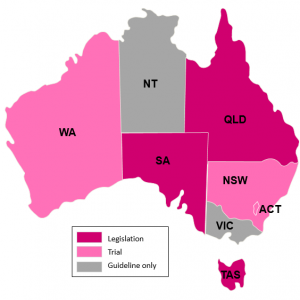 The launch enabled Amy Gillett Foundation CEO Phoebe Dunn to speak about this campaign and the Foundation’s intent to continue to push for legislation as we have successfully achieved all around Australia. See our progress here. To boost awareness, the TAC has an informative campaign page here. View the behind the scenes clip here, showing insight into the production techniques and importance of safe passing distances of cyclists here. On the last day of November, WA commenced its two-year trial of a metre matters, making it the penultimate state to implement safer cycling legislation in Australia. This milestone was an election promise realised by the new government and builds on their commitment to more cycling specific infrastructure. 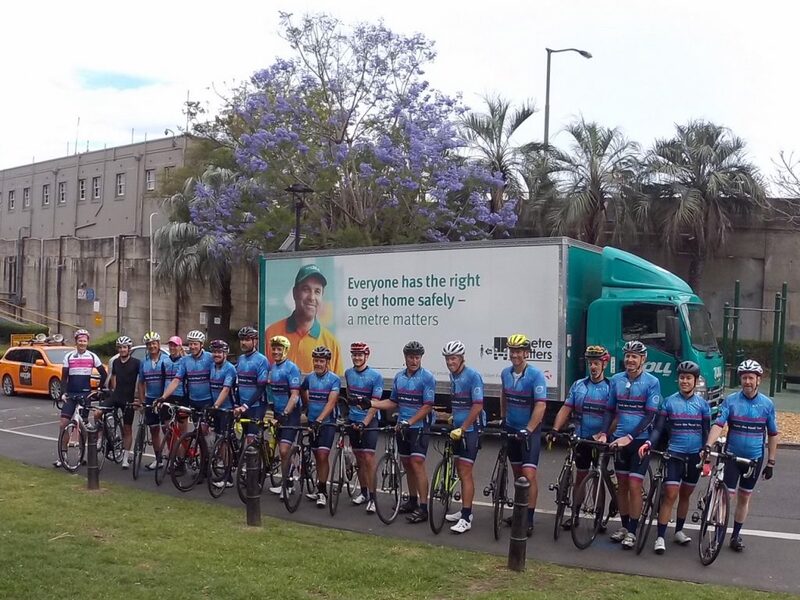 Another amazing edition of our Share the Road Tour arrived in Sydney on 17 November, having departed Coolangatta on a very wet morning on 11 November. Our peloton had cycled over 1,000km on some spectacular, hilly and gravelly roads, spreading our important cycling and road safety messages about sharing the roads and showing mutual respect and responsibility. Challenging but memorable, our participants had many a story about their week on the road, and left with new and cemented friendships and the knowledge that they had made a huge personal achievement and made an important contribution in support of the Amy Gillett Foundation. As always it was great to have our partners Toll at the finish line with a visible demonstration of their support. 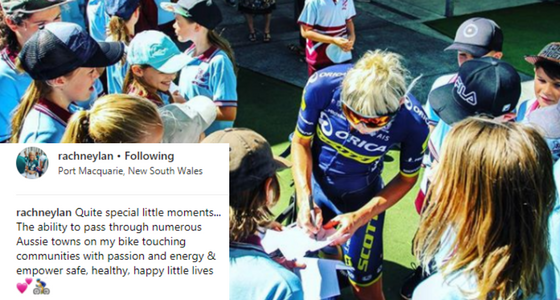 The Tour included Olympian and current Orica-Scott rider Rachel Neylan (about to join Movistar in 2018), our cycling scholar in Lucy Kennedy (about to join Orica-Scott in 2018) and Wiggle superstar Gina Ricardo (who would claim line honours at L’Etape just 3 weeks later). Joining our AGF Patron and living legend Phil Anderson on the Tour this year was Belgian rider Rudi Rogiers. Phil and Rudy raced together and their connection remains as strong as ever. Rudi’s wife Marlene was a wonderful addition to the support team, helping to pull together the logistics and provide a memorable experience for the riders. A highlight of the Tour again this year was our scheduled primary school visits, firstly at Lawrence then North Haven. On both occasions, students were glued to our presenters as they covered safer cycling techniques, bike maintenance, the importance of sharing the road, and answered lots of questions. See more from this year’s tour here. 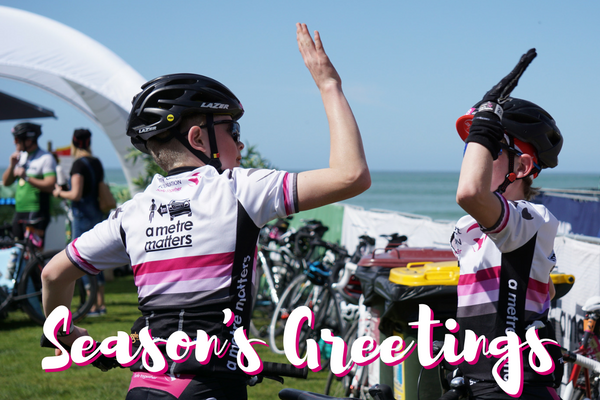 A heartfelt thanks to everyone who participated in the Share the Road Tour this year, from our fundraising riders, our current and former pro ride leaders, and our support crew and volunteers who work so hard to make it all possible. 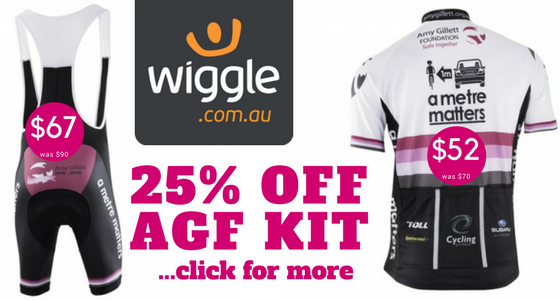 Thanks also to our key sponsors Toll, Wiggle, Sub 4 and Volvo Trucks for their support this year. Sign up here for the 2018 Share the Road Tour, with a spectacular route through the Victorian Alps. 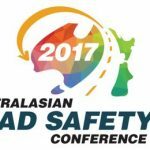 Our participation at the 2017 Australasian Conference for Road Safety with our 2017 Gruen competition was another success with some very creative video submissions received to tackle the very real issue of car dooring of cyclists. Judges included Dr Ioni Lewis from CarrsQ, Matt Fulton from WestCycle, Jason Dyktinski from Europcar and Amy Gillett Foundation Board member Dr Rod Katz. See all the finalist videos here. Thanks to all those who submitted entries, voted, the judges and to the conference for again including us in their program. Next year’s conference is in Sydney, details here. See all our submissions here. We’ve been busy representing the viewpoint of cyclists and other vulnerable road users in the process of development and deployment of autonomous vehicle technology. 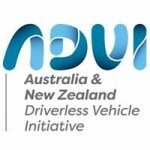 This includes a presentation by Amy Gillett Foundation Board member Dr Rod Katz at the recent 2nd International Driverless Vehicle Summit in Adelaide on 16 November 2017. 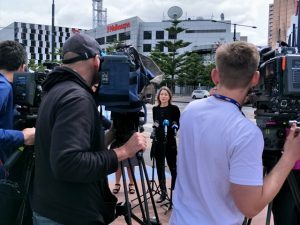 To ensure we maintain a cyclist’s voice throughout these developments, the Amy Gillett Foundation has recently become a partner of the Australia and New Zealand Driverless Vehicle Initiative (ADVI). Find out more here. 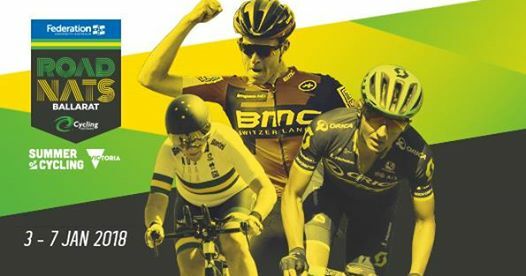 We’re proud to have been named the official Safety Partner of Cycling Australia for the Australian Road Nationals in Ballarat 3 – 7 January 2018. We’ve got some great, family friendly activities planned, so please come a see us at the Amy Gillett Foundation tent and have some fun! This spring more than thirty-five 50+ women took part in Amy’s Bike Skills, our 4-week program designed to give people the skills and confidence to ride their bikes safely and more often. Delivered by our friends Wheel Women in Geelong and Melbourne, the program covered safe cycling skills, route planning and basic bike maintenance, including how to fix a flat tyre. The Amy’s Bike Skills programs were made possible by grants from VicRoads and the City of Yarra. 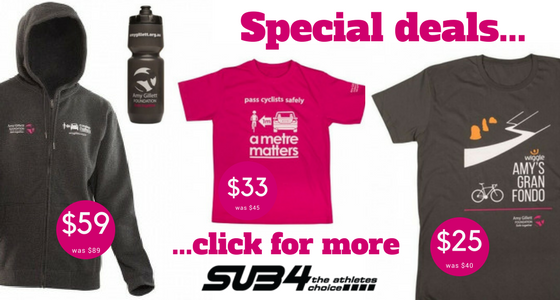 We thank them for their support of safer cycling. Read it here. Thank you Fairfax Media. Winners Bars are proud supporters of Amy’s Gran Fondo and the Amy Gillett Foundation! Warm wishes for the festive season.